ST. ALBANS, Mo. (Aug. 2, 2017) – Akshay Bhatia, 15, of Wake Forest, North Carolina, shot to the moon on Tuesday with a 28 on his first nine holes, as he carded an all-time course and championship record 61, at the 42nd Boys Junior PGA Championship at The Country Club of St. Albans. Starting on the back nine, the absolutely unthinkable round of golf featured eight birdies on his first nine holes and four birdies on his final nine holes (against one bogey), to flirt with some of golf’s most mystical numbers. The left-handed hitting Bhatia smashed the Championship record of 62 held by 2015 Champion Brad Dalke. At 14-under par for the Championship, Bhatia catapulted nine spots into the lead by three strokes over Jacob Bridgeman, of Inman, South Carolina. 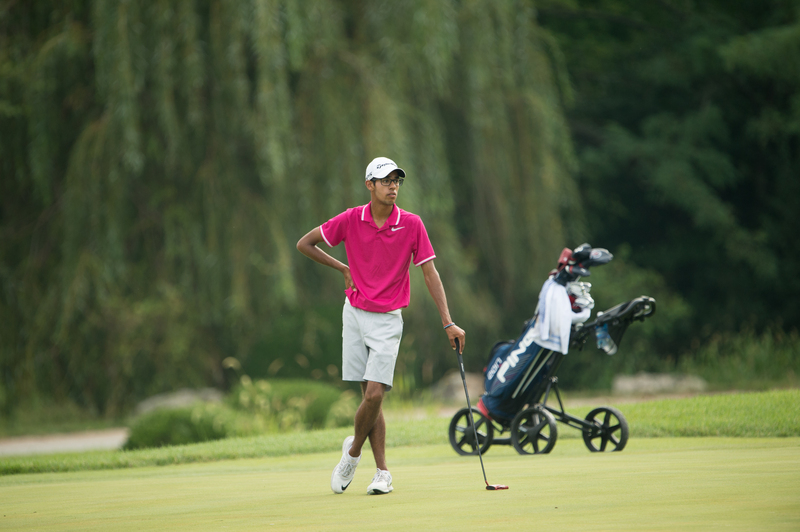 Bhatia eclipsed St. Alban’s Lewis and Clark Course record by two strokes. On his final hole (No. 9), Bhatia had an outside shot for a 59, with a miracle eagle pitch shot from outside the creek that fronts the green. Knowing he had a chance for glory, Bhatia went for it, and found himself six-feet off the pin. His putt for 60 pushed past the cup, and a two-foot par putt closed out a round that had several major college coaches from around the country swarming behind the Class of 2020 emerging superstar. Bhatia had five consecutive birdies out of the gate, before making par on his sixth hole (Hole No. 15). He bogeyed after making the turn on his 10th hole (No. 1), followed by birdies on his 11th, 13th, 14th and 17th holes played (Nos. 2, 4, 5 and 8). His round featured two 20-foot birdies on his fourth hole (No. 13) and eighth hole (No. 17), along with several clutch birdies from eight-to-12 feet. In June, Bhatia won the Davis Love III Junior Open event in Brunswick, Georgia. Bridgeman, 17, of Inman, South Carolina, a Clemson University commit, had a solid round of 68, to remain in second place at 11-under par for the Championship (65-68 133). Five shots back in a tie for third is Reid Davenport (66-69 135), of Austin, Texas, and Daulet Tuleubayev (67-68 135), of Cupertino, California. Tuleubayev is originally from Kazakhstan. In fifth place is another Inman native, Trent Phillips, a University of Georgia commit, who is seven shots off Bhatia’s torrid pace, after a 2-under-par 70 (67-70 137). The second lowest round on the day was a 66 by Carson Bacha (72-66 138), of York, Pennsylvania, who moved up 24 spots into a tie for sixth place, eight shots off the lead. He is tied with Jansen Smith, of San Angelo, Texas (69-69 138). First round leader Dawson Ovard, of Frisco, Texas, who shot a first-round Championship record 64, fell back to eighth place with a second-round 75 (64-75 139). He is nine shots behind Bhatia. The cut line was set at 4-over par. A total of 70 players will advance to Wednesday’s third round. The Championship will conclude with Thursday’s final round. One of golf’s major championships for juniors, the Boys Junior PGA Championship is where the best in the world get their start including: 2017 Open Champion Jordan Spieth, Tiger Woods, Phil Mickelson, Stewart Cink, Trevor Immelman, Justin Leonard, David Toms and Scott Verplank. Begun in 1976, at Walt Disney World Resort in Orlando, the Championship has been a popular stop on the national junior circuit for many of today’s PGA touring professionals. The Boys Junior PGA Championship doubled the size of the field this year and is conducting its Championship at The Country Club of St. Albans 10 days after the conclusion of the 42nd Girls Junior PGA Championship—which was won by Rose Zhang, 14, of Irvine, California in record-tying fashion, with a 72-hole total of 268. For pairings and tee times, please click here. For more information, please visit JuniorPGAChampionship.com.